As the bride, you want every single element of your look to be flawless. You want to look surreally beautiful from the top of your head to the tip of your toes – and that’s totally normal, given what a big day this is for you. 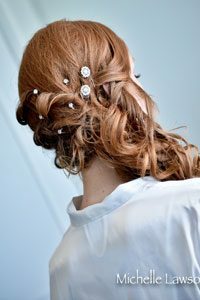 What are some hairpiece ideas you can coordinate with different bridal styles? We have some ideas and suggestions for you – so read on and find out more. If you want to steal inspiration from the Roaring Twenties, wear a feather blusher (this works fantastically with short hair too). If you want something a bit more modern, a Swarovski crystal crown or a hair chain will look absolutely gorgeous. In love with the timeless princess-like bridal looks? You have tons of reasons to be highly appreciative of this style – and if you are, you should totally invest in a pretty tiara. With crystals, diamonds, or even pearls, a tiara will add class and beauty to your bridal look regardless of your hairstyle. Are you the kind of bride who wants to show off her minimalist, modern look? Opt for simple, geometrical pieces that add a special touch to your style. For instance, you could pull your hair back with a round metallic-colored hairclip, or you could adorn your long hair with a pearl hair slide that will blend into your locks and make you feel truly precious. Looking for the very best bridal hairstylist and makeup artist in Florida? Be sure to come and see what Ultimate Bridal Beauty has to offer – we’re here to make sure you feel absolutely royal on your Big Day, so you can rely on us to provide you with attentive, quality services. Our experience and talent are on your side, so don’t hesitate to contact us today!